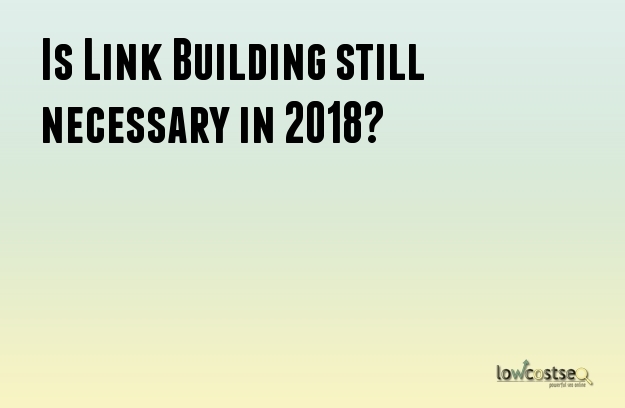 Link building is a necessity in SEO even in 2018. With the growing list of dos and don’ts, link building remains to be an important ingredient for a successful SEO campaign. This process of obtaining links from other websites to yours requires meticulous judgement and effort for search engines to properly crawl your website and find out if it is trusted by many or not. Perhaps it is one of the most challenging ones (depending on the technique) as it requires a lot of time for trial and errors. Still, it is fairly doable and just needs focus from a search engine optimizer. Speak to one of our SEOs, who have mastered link building since it was known, and you’ll be able to learn a few things or two before you get started. Or even get the help you need ASAP. As mentioned, there are some techniques that can be used for acquiring links. With 2018’s trend and the search engines’ need for displaying better pages, these two link building techniques can be considered for your advantage. This technique is consistently relevant in the process of link building. The best way to do guest blogging is to make it look natural to make it easy for search engines to identify the legitimacy of your web page. Producing a worth-reading article and getting 20 to 30 backlinks can already give you a good start. An awesome start even, considering getting 5 backlinks is difficult enough especially for new websites. A few of the best entrepreneurs online have used guest blogging a lot in the past (and today) by sharpening their strategy well. · Set a Criteria: This link building strategy usually fails when it is being used hastily. So that’s a move we should always walk away from. Instead, let’s set a criteria in order to acknowledge if an opportunity is worth the risk. Collect info like how many monthly page views they have, if you’re sharing the same target audience, if they have a social following above 3,000 or 5,000 (depending on your own status), their monthly site traffic, and so on. · Set a Relationship Before Pitching: We all know what it is like when a total stranger comes knocking at your door, it doesn’t have that welcoming feeling. Same goes with engaging with people online, it needs to be warmed up first. This is fairly easy through social media and e-mails. Make sure a relationship is established for the site owner to acknowledge your quality of work. · Study the Bio Section: With the info provided, you’ll get the bigger picture on the links that you should and should not get. It is also one of the best ways to know the group or the site you are working with. Instead of finding the best source, why not opt to becoming the source? Although it’s one heck of a challenge to do, considering everything seems to be written online these days, it is still worth the shot. Creating and using data-driven content for link building worked for so many who dug deeper and used statistics to drive more traffic on their site. Test it yourself. Which topic interests you more nowadays? If it is about the UK statistics for internet access, you might find out at the very first page of a Yahoo! search is a page from Statista.com. This site uses ranking, demographics, and statistics to provide information regarding the use of home internet in the UK. This type of data is pursued by many as it can back their own researches as well. Same goes for small business owners who can use data driven content in their advantage by writing one that people will want to link to. Collaborate with as many reliable people as you can to have more support in your content. If you want to start your own survey, you can take advantage of tools like Google Consumer Survey and even use the data collected for your SEO strategy. Of course, make sure that the content highly relates to what your site is all about and refrain from going off-topic 90 percent of the time. Visualize your data before presenting it to the public and let it be shared by your community for more visibility. If there are good methods, then there are also the unreliable ones. These SEO link building mistakes still end up getting abused nowadays and some are even unaware of it. Have hundreds of backlinks to your homepage: It is true that we’re aiming for tons of backlinks but if it is only leading to your homepage, it might not matter a lot. It is the content that you should be promoting as it is where the details and the conversion can come from. Additionally, it won’t look natural if all of the backlinks are to your homepage. Quality vs. Quantity: The backlinks that matter the most are the ones that are genuinely linked by reliable bloggers or sites. Although the numbers do matter, having hundreds in a span of 1 week is another way of not being natural. Exchanging links with de-indexed sites: It’s like hitting two mistakes with one stone. There are quite a number of web pages that have received warnings from Google already. These sites are often driven by spam or thin content. Building a relationship with such site is a waste of time. Although you can still take advantage of some reciprocated links, eventually, it will all backfire. Not getting involved with the site is vital. Paid links: As interesting as it sounds to buy links at a cheap price, once the results start rolling in, you’ll find out it was just a waste of time. Guest blogging and constructing data-driven content may not be considered as the main link building method for your SEO but using it from time to time can build your understanding towards how the web reacts on quality content. With a little guidance and help from our expert SEOs, your pages can earn organic traffic soon.